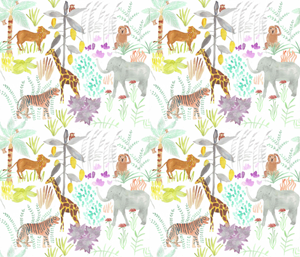 One of the things I have most enjoyed about being self-employed has been the opportunity to design fabrics. I trained as a surface pattern designer between 1995 and 2000, by means of a degree studied part-time. Although I then taught Textiles in school, this mostly involved encouraging the students’ creativity, rather than exercising my own. Over the two years since I began Amanda Jane Textiles, I have drawn and coloured 69 designs, which Spoonflower can print onto a wide range of fabrics and also onto wallpaper and wrapping paper. Anyone can go on to the Spoonflower website (www.spoonflower.com) and order original designs from literally hundreds of designers. Spoonflower now has a base in Berlin, Germany, so items can now be produced and sent within Europe, where this is desirable. My fabric designs are all visible in the ‘Amanda Jane Textiles’ online studio on the website (click here to see them). Many of them have been created in response to the Spoonflower ‘contest’. This used to occur weekly. Recently, it has changed to a once-a-month challenge, which provides a useful brief to work to. 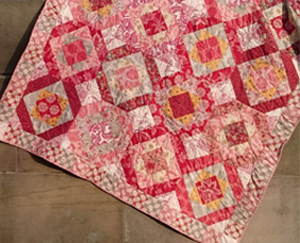 This month, the challenge was set by a company called Story Patches (www.storypatches.com) who have devised a quilt label which includes a computer scan-able code, giving access to pre-recorded message about the quilt. So the brief was to design a set of four labels on the theme of ‘family’. I wanted to create images that wouldn’t be too prescriptive of the type or size of family and in the end choose to depict family relationships among creatures. The idea came from a chance happening a week or so ago in the Druridge Bay Country Park, in North-East England. A mother swan with quite a crowd of cygnets was swimming near the bank of the lake. Last year I made a dolphin quilt for my niece (click here to see this), so a mother and baby dolphin became the subject for the label top right. Dachshunds have always been popular in our household (notional ones, I should add, never yet an actual dog), so that made another ‘family’ (top left). Finally, there have been reports of peacocks in our County Durham village (click here if you don’t believe me); they even made the national news, briefly. No-one seems to know where they have come from and they are considered a nuisance by some local inhabitants and valued by others. So they became the subject of the fourth label bottom right. Where do ideas come from? Well, from all over the place! It’s an online link party where creative bloggers show their workspace and it takes place this Friday.